Headaches are a common condition that just about everyone will have to contend with at one time or another. But what if you are struggling with a chronic headache condition or you even just get a few headaches per month? We are going to take a look at some of the most common headache conditions and give you some quick tips for dealing with them. In conclusion, we will look at a natural way to combat many different headache types that can potentially have the same underlying cause. 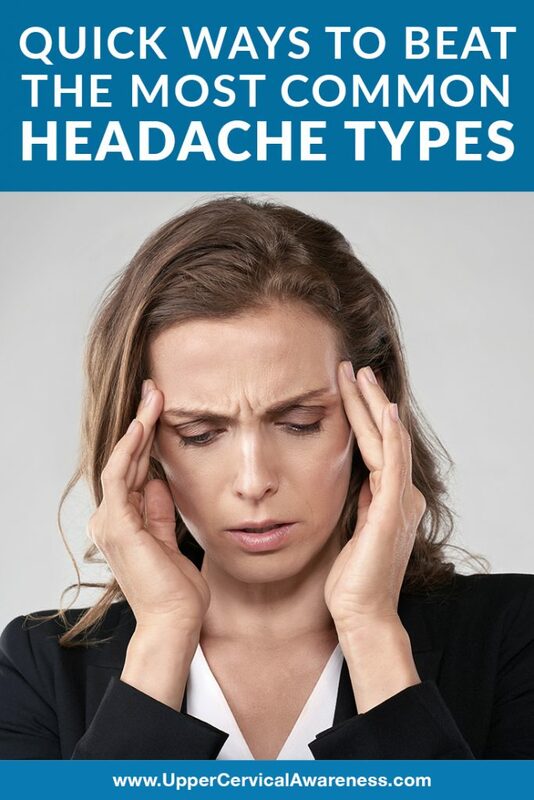 On the list of the most common headache types, this always has to be number one. Tension headaches are the type you get when you have a stressful day at the office and now you feel like there is a really tight headband stretched around your head. People who only get this type of a headache on occasion will usually grab an over-the-counter pain reliever. But our next type of headache will reveal why you shouldn’t do that if you get more than a few headaches per month. Rebound headaches occur due to medication overuse. It can be an over=the-counter medication or a prescription medication. Always check the label to see if this is a possible side effect of medication, and never take more than directed. Over-the-counter does not automatically mean safe. If you regularly take headache medication and your headaches seem to become more frequent, this could be the problem. The only way to know for sure would be to stop the over-the-counter pain reliever for a couple of weeks to see if you get fewer headaches. Migraines are not so much a headache type as a neurological condition that causes headaches, but it is still one of the most common headache causes. About 39 million people in the US alone get migraines, and 85-90% of migraines feature a headache phase. Headaches are usually moderate to severe and involve pulsing or throbbing pain. About two-thirds of the time, the pain is only on one side of the head. Many patients complain that migraine headaches grow worse with exertion. Additional symptoms include sensory sensitivity, neck pain, and nausea. The combination of symptoms makes this one of the most debilitating causes of headaches. This is a very common headache type because it includes many of the other headaches we are discussing. Secondary headaches are those that are caused by a separate underlying condition. So, for example, a migraine headache is a secondary headache because the condition that is causing the headaches is migraines. You can also call a headache a secondary headache if it is caused by a head injury, a sinus infection, the flu, or any other number of conditions. Injuries are another common cause of headaches. A concussion, in particular, can lead to post-concussion syndrome. Headaches are one of the primary symptoms, along with things such as vertigo, neck pain, mood changes, cognitive problems, insomnia, and a number of other issues. Besides head injuries, there is also a large overlap with the symptoms of whiplash-type injuries. Headaches, neck pain, and vertigo are especially common during the aftermath of both types of injuries. In both cases, the injury can lead to a misalignment of the upper cervical spine. This may play a role in the onset of headaches and other symptoms. One very common cause of headaches is frequently overlooked. It is an upper cervical misalignment. This is why many headaches start in the neck or have neck pain as a symptom. It can also explain why headache conditions often begin in the wake of head or neck trauma. Here are just a few ways that slight misalignment of the atlas (C1) can lead to various headache types. Brainstem function – The atlas surrounds and protects the brainstem. However, even a very slight misalignment can disrupt proper brainstem function. This can play a key role in migraines and other headache types. Blood flow – The cervical spine facilitates blood flow to the brain. A misaligned atlas can alter this blood flow, resulting in certain parts of the brain receiving less oxygen. This is another possible underlying cause of headaches. Intracranial pressure – When the upper cervical spine is misaligned, cerebrospinal fluid may fail to drain properly. If this occurs, the pooling can lead to increased intracranial pressure and headaches, along with other symptoms. If you are suffering from an atlas misalignment, what is the safe and effective way to correct the problem? We would like to introduce you to a chiropractic subspecialty that most people have never heard of. Upper cervical chiropractors specialize in detecting and correcting the slightest of atlas misalignments. Precision imaging techniques are used to find misalignments that are just fractions of a millimeter. Then, a precise adjustment is calculated for each patient. Adjustments are always gentle (none of the popping or cracking you may associate with chiropractic) and are very safe. If you suffer from headaches, this may be the way to correct the issue without medication. To learn if upper cervical care is right for you, locate a practitioner in your area and schedule a no-obligation consultation. You may join the many patients who are experiencing the benefits of correcting a long-standing misalignment that you never knew you had. For some patients, it has even meant the end of chronic headaches.